People say that time heals the wound, the pain. But it really doesn’t. One is never too old to need a mum. We all go on with our lives but not a single day goes by when I don’t remember my mum. Missed you tonnes when my children got married, miss you when its Mother’s Day, miss you when its your birthday, I don’t have the heart to call dad when its your wedding anniversary, miss you when I need some advise, basically miss you every moment. Remember how so proudly you’d bought a whole dinner set for me when I’d moved to my new home. Still use it everyday. I use and treasure your orange scarf that you had bought when you went to Japan with dad. Some your favourite saris I treasure. My mum was not a person who liked to hug and kiss all the time, she was a practical person and really didn’t know how to ‘sugar coat’ what needed to be said. However, that does not mean she didn’t care or love us. My mum, by just listening to my voice could make out when I was sad or if something was bothering me. I would try to be as cheerful as possible but though she was miles away, she knew exactly what was going on in my head and heart. I remember once I didn’t call her on Mother’s Day (the UK one) and she got upset. I told her that I will wish her in May when we celebrate Mother’s Day here and she just stated ‘but for me its today!’ So I wished her and then wished her again in May. So then she wanted to know why my siblings (both residing in UK) didn’t wish her! So basically there was no winning with her! My mum was a pretty simple woman, very homely, loved watching movies and loved the beach though she didn’t know how to swim. In that respect she was fearless. She would waddle into the sea and enjoy while my dad would be left on the beach barely getting his toes wet! For her, her world was the family. Looking after us, cooking for us was what she did. Her style of cooking didn’t involve elaborate methods, or too many spices. I don’t remember her ever using clove powder or cinnamon powder in her daily cooking. When she made Indian sweets then all the exotic spices would be used. She mainly used fresh ginger, chillis, garlic and occasionally onions to bring out the flavour of the whatever she prepared. My mum loved making and having simple matar kachoris. She’d use only peas with a bit of fresh coriander, ginger and chillis. The end result would be such a satisfying, delicious snack for all of us. I remember she would sit on the kitchen floor in the afternoon, and prepare these for the whole family. Back then we didn’t have modern gadgets, no Kitchen Aid or Moulinex. She would take the hand mincer which had several types of sieves and hand grind the peas. For a family of over 14 members, she must have made so many. I remember I used to help her roll the dough into tiny puris, and then she would ask me to pinch and twist the dough to seal the edges or ‘do the kangri’ as we call it in Gujarati. When she fell sick and couldn’t do much in the kitchen, my visits to her would mean that during my stay at least once we’d have to make her favourite snack. Then the roles were reversed, she’d help to roll the dough and I’d make the filling, stuff the kachoris and fry them. Dedicating this recipe to my wonderful. beautiful mum…. miss you so much. Its the little things we loved about you. Add water and make a dough that is not too soft or too hard. Just knead it enough so its smooth. Don’t knead too much otherwise the puris will shrink when you try to roll them out. Cover the dough with a lid or damp cloth and let it rest for 30 minutes. Wash and process the peas till you get a course paste. Don’t process them till they become smooth. Immediately add the minced peas. Add the ginger and chilli paste. Mix. Cover the pan and let the peas cook for 4-5 minutes over low heat. Stir the mixture gently twice or thrice during the cooking time so it does not stick to the bottom of the pan. If the mixture becomes too dry sprinkle a tablespoon or two of water over it. Take the pan off the heat. Remove the lid and let the filling cool at bit. Add salt, sugar, dhana jiru, lemon juice and coriander and mix well. Divide the dough into 30 -35 parts. Roll each part into a ball. It should be size of a big marble. Roll one ball into a circle of nearly 3″ in diameter. Make a boat shape by pinching the two edges at the middle (see photo). This helps to fill the stuffing easily. Take 1½ tsp of the filling and put it in the boat. Bring the edges together and pinch to seal. Make twisted pattern. If you can’t do that then make a pattern using a fork. Put the kachori on a lightly oiled tray. Repeat steps 2-5 till the filling and dough is over. Heat oil in a deep pan, wok or karai over medium heat. When it is hot, drop in 6-8 kachoris and fry them over medium heat, turning them over frequently. Remove from the oil with a slotted spoon when the kachoris are light brown in colour. Serve hot kachoris with a chutney of your choice. Usually coriander and mint or coriander and mango chutney goes well with it. Its best to use fresh peas. If you want to serve the kachoris later, then fry them in hot oil for just s few seconds and remove.At this stage they can be stored in the fridge till required. Heat oil and fry them over medium heat. The dough should be pliable. If it is too hard, then it will be difficult to seal the edges. If its too soft the kachoris will not be crunchy. What a beautiful post Mayuri — thoroughly loved reading it. I'm sure your mom is watching over you every minute and even though she's physically not with you, she'll always be around in spirit. Those pea kachoris look amazing. SO touching write up.Thanks for inviting me to be a part of this mother's tribute series. Mayuri – what a lovely tribute to your mum. You are right – we never stop missing them. I love your kachori recipe and like your style of filling them. These look delicious, I usually make my katchoris in the traditional round shape I love the shape you have given then like ghugras. Awesome share Mayuri. Matar kachoris looks super tempting. Oh my goodness..this looks and sounds delicious. I love peas and I love pastry. The perfect combination! Mom’s recipes always remain close to our hearts.. specially all the tips and tricks they shared with us. I have tasted these kachoris at my friend’s place .. never tried making them at home. Thanks Shobha, yes what we learn from our mums and grandmothers stay with us forever. Try this simple recipe, and sure you’ll like it. Beautiful write up. Loved rereading. Matar kachori looks delicious. We also make matar kachori like this but little different. Will share the recipe sometime. Thank you so much Sujata and looking forward to your version. Felt so touched by the post. My mom is too very practical and she loved us in her ways…never pampered us and hence today I am strong. I think Moms make the best Kachori’s. The shape of the kachori is so in inviting. And even though it is with peas and few masalas, anything which is from mom is the best. Kiddos to you and your mom. Aren’t we really to have mums who made us strong. My mum always would make the gujiya shape for kachoris. For her there was no right way or wrong way. It just had to work. Such a beautiful written post. I had the feeling I got to know your Mom a little bit. I’m lucky to still have my Mom but I know what you mean about always missing your Mom. Something happened to my Mom recently where someone she trusted stole from her. Although we are very close and she talked to me about it, she still was so upset and was wishing her Mom was here so she could talk to her Mom. This recipe looks like such a delicious way to remember your Mom. Thanks Mireille. Whenever my family makes kachoris, they remember my mum. 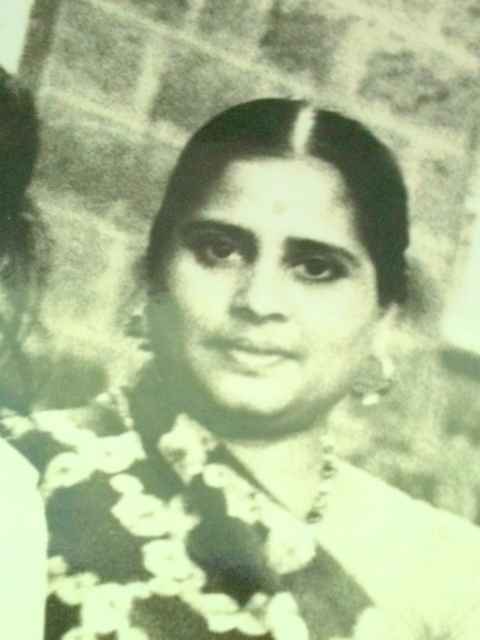 Mayuri – what a lovely way to remember your mum. The kachoris shaped like ghugharas look so perfect. Thanks Mina, that’s how she always shaped them. Loved reading your post and memories. True that no one can replace mom. The Kachori’s even though with a simple filling , looks so delicious and when it is mom’s recipe it got to be. Beautiful shape as well. Thanks Renu, it was my mum’s favorite and she would make it so often. Beautiful writeup Mayuriji!! Moms are the best in anything they do.. this is one of the best ways to pay tribute to mom.. she must have been very proud of you if she was around.. the love and respect for you mom that has gone into making these kachoris must have made these more delicious!! Great post!! Thank you so much Swati for the lovely comment.